With the launch of their new website, the Green Belt Movement (GBM) is sharing the good news about forest restoration in Kenya using a new web mapping tool developed by Blue Raster. 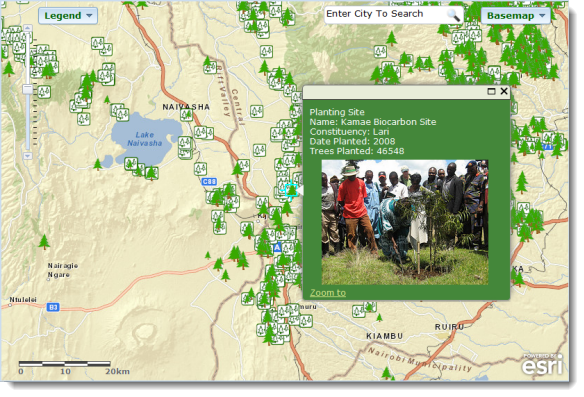 The GBM Impact Map is an interactive application that charts the progress of GBM’s tree planting initiative, which mobilizes Kenyan communities to start tree nurseries and plant seedlings on public lands and degraded forest areas. Since 1978, GBM has worked with communities to plant more than 47 million trees in Kenya to address environmental concerns regarding deforestation, soil erosion and lack of water. The GBM Impact Map will help donors, volunteers and concerned citizens visualize the results of GBM’s tree planting initiative. “Reliable location-specific data provided by the GBM web mapping application is vital in planning and monitoring the impact of our watershed-based projects. The ability to map and track the projects on the ground ensures that we are effective and efficient in our work across Kenya and also that the impact of our work is measurable,” said Wanjira Mathai, International Director of the Green Belt Movement.